Matinée debut from top London pop duo The Pines, featuring the prolific and wonderful Joe Brooker (also one-half of The Foxgloves) and the incomparable loveliness of Pam Berry. Pam's distinguished resume includes association with countless indie undertakings of the past decade, including Belmondo, Black Tambourine, Bright Coloured Lights, The Castaway Stones, Chickfactor, Glo Worm, The Seashell Sea, The Shapiros, The Snowdrops, and Veronica Lake, plus guest spots on recent recordings by The Clientele, Jasmine Minks, The Lucksmiths, The Relict, and The Saturday People. In other words, this gal can sing! This superb EP is the second half of the thematically-related "True Love Waits" series (the first recently released on fresh DC imprint Foxyboy Records) featuring the most compelling Pines compositions to date. 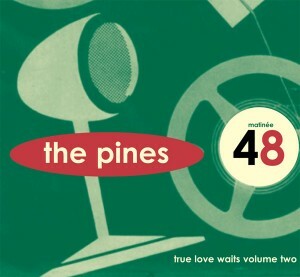 With five exclusive new songs, "True Love Waits Volume Two" showcases the strong songwriting, intricate guitars, clever lyrics and exquisite harmonies that make the Pines so special.